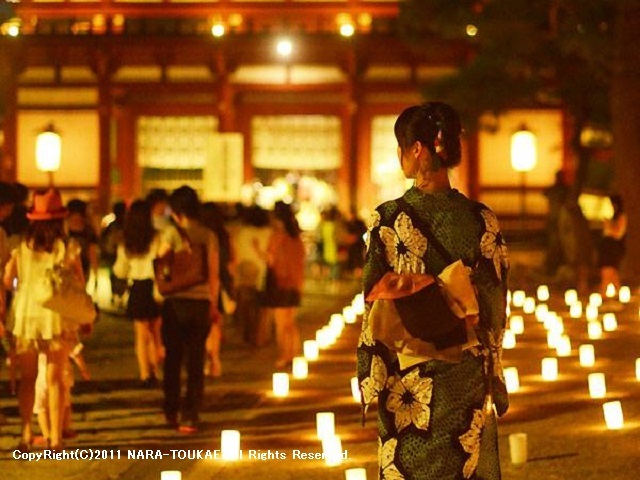 Nara Toukae is held at Nara National Park in early August every year. A lot of candles will be lit up on historical buildings and the streets including Nara National Museum, Todaiji, Kasugataisha in Nara. You can feel a quiet and romantic atmosphere there. Also, you can join lighting a candle for 500 JPY. There are some concerts at night in the park. Participants have been increasing every year and pproximately 950, 000 visitors came to this festival in 2018. For the latest information, please check their website.